New plan, watch the game o television from the bars in the corridors of the arena. This what happens when a city has a winning team and a Fed money spigot sits right underneath the region pumping out oodles of funny money. 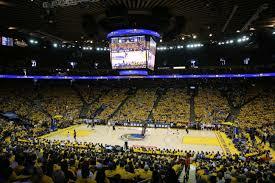 The "In The Building Pass," according to The San Francisco Chronicle, is a ticket that allows entrance into the Oracle Arena, with no reserved place to watch the game in person. Pass holders can't see the court; rather, they can only watch the game on a television at the arena's bars and club areas. Perfect for millenials that are more interested in screens than reality.